It was after 3 a.m. Monday when Bonnie X Clyde left the packed house party in St. Petersburg, cop cars outside and a long line of revelers down the block. 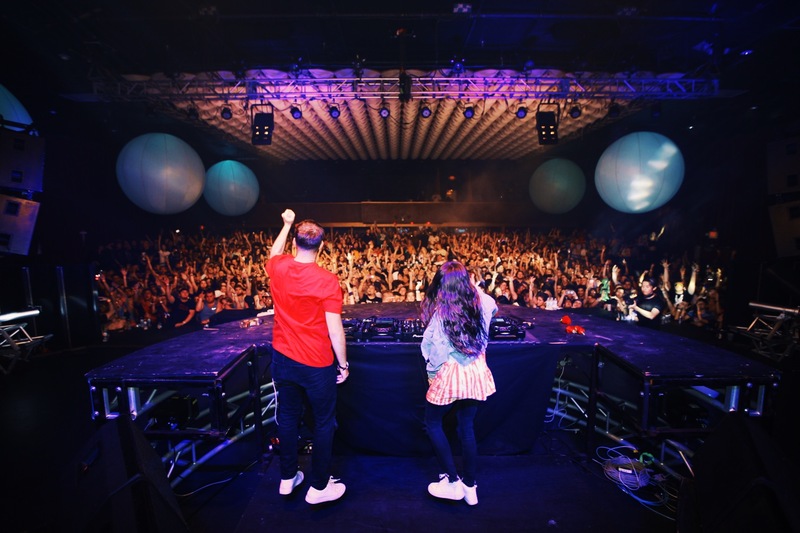 Ten hours earlier, they were scheduled to perform on the main stage of Tampa's Sunset Music Festival, spinning an hour of electro-pop for a crowd of up to 20,000. But when the city canceled the festival's second day due to fears over Subtropical Storm Alberto, the duo had to scramble. And scramble. And scramble. And now here they were, leaving their final party of a long, meandering night that saw them surf a social media wave from Ybor City to Carrollwood to Clearwater Beach to south St. Pete. And still fans were waiting outside. "Everyone has this expectation of the excitement that's coming from the festival," said Bonnie X Clyde's Daniel Litman. "All that expectation and all that pent-up excitement's still there. It was cool to just see it come out all at once." When the city pulled the plug on SMF on Sunday, it didn't just leave fans in a lurch. It meant dozens of big-name DJs, some of whom had flown in from around the world, suddenly had an open night on their Memorial Day weekend calendars. 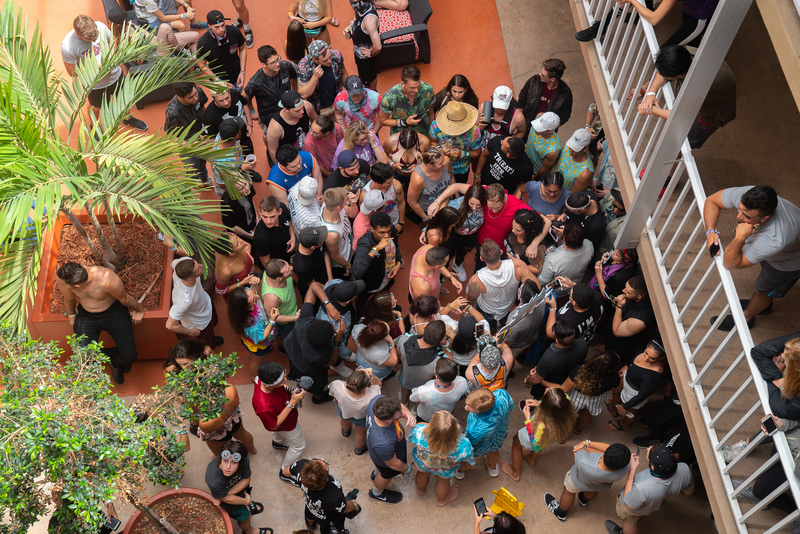 Many made their way to festival-sanctioned make-good parties, such as a star-studded bash at the Ritz Ybor featuring almost every SMF main stage headliner. But none of them had a night like Bonnie X Clyde. The Virginia-bred, L.A.-based duo of Litman and singer Paige Lopynski started their project in Miami, and still have devoted fans in the Sunshine State. They were thrilled to be playing Sunset's main stage in what would've been their biggest Tampa show ever. After arriving on Saturday, they holed up in their hotel room to make final tweaks to their set. The next day, as they were getting ready for their shuttle around lunchtime, Lopynski saw the official announcement on Instagram: SMF had been canceled. "I was so bummed," she said. "We were all bummed. But we were immediately like, What's our next move?" Thus began an afternoon of furious calls, tweets, DMs and texts, as Litman and Lopynski tried to figure where to go next. Just before 1 p.m., they tweeted: "IF ANYONE IN TAMPA HAS A HOUSE THAT IS BIG ENOUGH / are down to throw house party comment below!!" A fan tweeted a photo of the Ramada Westshore Tampa Airport. "OTW," they replied. And when they showed up 30 minutes later they were greeted by dozens of cheering fans. "In that moment, it kind of sparked something in us," Lopynski said. "We were like, Wow. There is a ton of incredible people that are just waiting to have a good time in the area." They doubled down, making calls, taking suggestions from fans, calling clubs to find out their capacities "to see where we could go where we could reach the biggest amount of people," Lopynski said. They lined up an after-hours house party, but it fell through. They kept fielding offers. They needed wheels, so they booked a party bus for their crew. First stop was the sold-out main party at the Ritz Ybor, where they played from 10 to 11 p.m., good enough to leave town with their expected festival paycheck. Then it was off to Whiskey North, a far-flung nightspot in Carrollwood where fans who'd been following them on social media were already waiting. "We showed up and kids were just swarming toward us," Lopynski said. "I felt like everybody was on the same vibe." 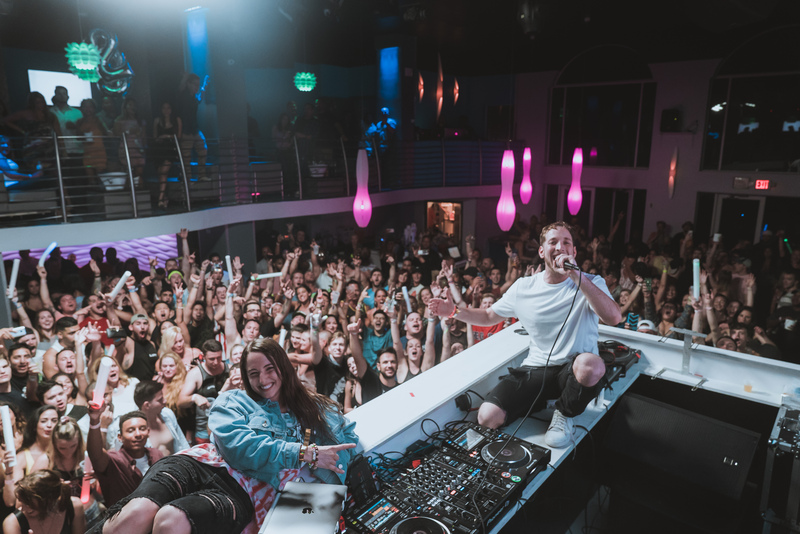 After a quick set that ended shortly after midnight, it was over to Shephard's Beach Resort in Clearwater Beach, where another popular EDM duo, Krewella, had headlined an outdoor show earlier in the evening. "I think people were expecting to have (the energy) turned down, but they walked into the club and it was like another huge party," Lopynski said. "People were just going nuts." After another set at Shephard's, it was off to St. Petersburg, where they'd finally secured a legit house show hosted by "our manager's friend, or a homey, or a manager's friend's homey – something that was good enough for them to be willing for us to tweet out their address," Litman said. By this point it was after 2 a.m., and they were sweating their flight back to L.A. at 5. But there was no going back. They'd long since announced the show on Twitter. The SMF diaspora was already there, "probably half a mile of kids parking," Litman said. For about 15 minutes, Bonnie X Clyde played their best-known songs to a wild living room full of delirious fans, some perched on each other's shoulders, others capturing the moment on their cell phones. "It was the most insane thing," Lopynski said. "I've never seen so many kids in a house like this. It was crazy." St. Petersburg Police received three calls about the commotion on the block, and by 3 a.m. had dispatched eight officers to the scene. But there were no arrests or citations; the party began to dissipate shortly after they arrived. "Our fans helped them clean up, and there was nothing broken and none of the equipment was messed up," Litman said. Bonnie X Clyde made it to Tampa International Airport less than an hour before their flight, four gigs and a meet-and-greet under their belts. And aside from the gig at the Ritz, Litman said, they didn't make a dime from any of it. Recounting the experience on Monday evening, exactly 24 hours after they were supposed to have played Sunset's main stage, they sounded more amazed by it all than exhausted. "A majority of DJs come from a place where they were once in these kids' shoes," Lopynski said. "We were going to these festivals. I still have these other artists that I look up to. … That's a huge reason a lot of us are doing this, is because we've been there, we know what it's like to be disappointed. And you always want your artists to go out of their way to just pop up someplace and surprise you."